Could this boy perhaps have been the youngest person ever convicted of a crime and sent to jail? Three-year-old Swiss is convicted as a thief. 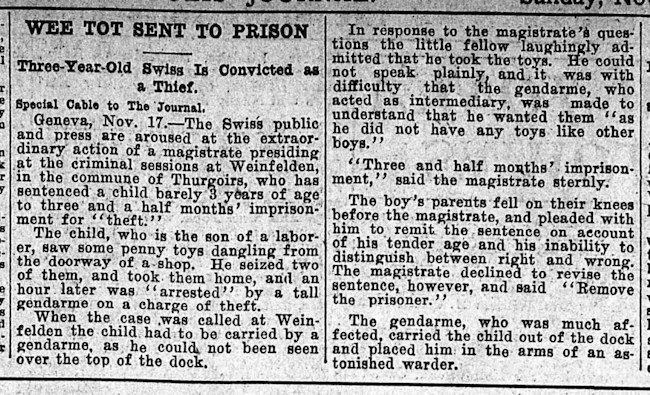 Geneva, Nov. 17 — The Swiss public and press are aroused at the extraordinary action of a magistrate presiding at the criminal sessions at Weinfelden in the commune of Thurgoirs, who has sentenced a child barely 3 years of age to three and a half months' imprisonment for "theft." The child, who is the son of a laborer, saw some penny toys dangling from the doorway of a shop. He seized two of them, and took them home, and an hour later was "arrested" by a tall gendarme on a charge of theft. When the case was called at Weinfelden the child had to be carried by a gendarme, as he could not be seen over the top of the dock. In response to the magistrate's questions the little fellow laughingly admitted that he took the toys. He could not speak plainly, and it was with difficulty that the gendarme, who acted as intermediary, was made to understand that he wanted them "as he did not have any toys like other boys." "Three and a half months' imprisonment," said the magistrate sternly. The boy's parents fell on their knees before the magistrate, and pleaded with him to remit the sentence on account of his tender age and his inability to distinguish between right and wrong. The magistrate declined to revise the sentence, however, and said "Remove the prisoner." The gendarme, who was much affected, carried the child out of the dock and placed him in the arms of an astonished warder. If you're old enough to do the time you're old enough to be granted swiss justice! Wow, that is terrible, wonder what happened to the poor little one. What happened to the child was probably nothing at all, because it didn't exist. I'd want a citation from a local Swiss, not Minnesotan, journal before I believed a word of this. I wouldn't even believe it today, let alone in 1906. Defending the home team Richard? Not my home team, anyway. I'd have said the same if it were a Swiss (or Dutch!) newspaper from 1906 writing about a toddler being send to prison in Alabama. It was more a comment on the reliability of journalism back then. I know honey, I was just kidding. An Air Force wife told me of a girl of six whose arm was cut off by the Saudis for shoplifting. The child repeated the offense some years later and lost the second arm. Saudi men probably stroke off to this sort of thing. What you're referring to is Sharia Law. The right hand (the clean hand) is taken for the 1st offence of theft. Because only the clean hand can be used when interacting with people, especially during meals, this makes the person an outcast. The damage done by the loss of the 2ed hand is obvious. So, the next time some politician thinks it's a good idea to land 10,000 unvetted Muslims on American soil you might want to protest that decision.